I am writing on behalf of a group of diverse and hardworking coworkers among whom morale is at an all time low. Our often bumbling managers have a history of granting knee jerk behind the doors promotions, creating new positions without posting them and making surprise staffing changes. Some of us have had four different supervisors in five months. After a recent escalation of this behavior the office crab complained that these job changes were never posted. Alas, when a management job opened up, this time upper management briefly posted the job but quickly gave it to the complainer. 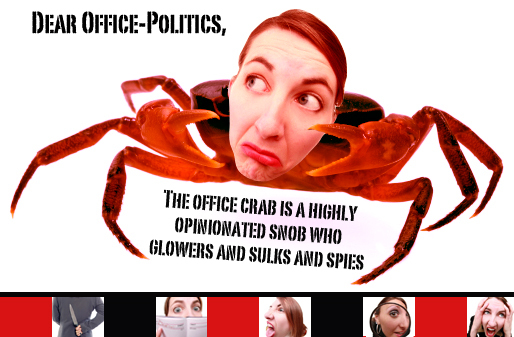 The office crab is a highly opinionated snob who glowers and sulks and spies, tells tales and criticizes everyone in writing to upper management. She glowers, e-mailing unsolicited and scathing critiques to peers about their conduct and work product. This individual who is highly disliked has a pattern of making herself superior by contrasting herself to the rest of us. We have tried to ignore it but now we face certain sabotage, both individually and as a group. Short of hiring a hitman or spiking the coffee with Xanax how do we deal with this? We find ourselves already dodging bullets right and left; people with sterling reputations are being undermined and find their work product and peace of mind attacked in new and startling ways. A Rose is a Rose is a Rose, and a Pig is a Pig is a Pig. Sorry to be so crass, but “the Office Crab” clearly is a destructive, overly political, sabotaging, dark cloud, loud-mouth and under-performing know-it-all. Other than that, she sounds like a great gal! The knee-jerk reaction with such bullies is to either give in and “put up with” it or “put down” the jerk right back, but these extremes will just make you a perpetual victim (if you meekly accept the abuse) or part of perpetuating the toxic environment and culture of incompetence (if you stoop to her level of maturity). Also, if you reactively strike out, you may earn a reputation of being the real saboteur and negative force. This even happens in sporting events in which the first athlete fouling another is often not penalized–– instead, it’s the retaliator. So hard as it is, try to practice verbal discipline and restraint (at least in public) so that you can better assess the landscape, analyze the possible reasons her outlandish behavior is being allowed, and strategize accordingly. But rest assured, you’re not crazy. This person is a clearly disturbed tyrant and you have a throng of people who can provide testimony to that sad fact. So at least grab some peace in that knowledge. Now what?? In Your Dreams: A Coaching, Training, or Organizational Development Approach. In companies with competent top management, the first line of defense with this kind of person is for the organization’s management and human resources department to bring in a coach or counselor to work individually with the abrasive person who has now risen so high, her behavior is now too visible to be overlooked. Serious consequences can be laid out, and the person’s job is put on the line. We know we’re now back-pedaling to think this old dog can learn new tricks, but who knows? Maybe her sad life and own sense of being burned by life has creating her lousy life script in which she now dumps on others as she’s felt since she was a tiny crab. (b) does this help our clients/customers? (d) does this help the person I’m writing about? Obviously, most well-meaning people can be coached and trained to filter their actions through these screening questions to realize if the answers are “no” to a question, then perhaps the email or memo is not appropriate. But your antagonist clearly most likely won’t bite; still, you never know, and I’d be remiss to just assume her behavior is impervious to common approaches until tried. A second route is for individuals around the offender to develop strong feedback and interpersonal skills to manage the buffoon as well as positively impact the team and enterprise in many other ways. So communication skill-building need not be positioned remedially, but as developmentally needed for all to benefit. This approach is a bit subversive, since the intervention’s real purpose doesn’t even get named as far as the Crab is concerned. The needed learning objectives are communicating skillfully about any workplace destructive pattern of behavior, how to forge clear agreements about inter-employee treatment, and conflict management. The best book we know for teaching this set of assertive, constructive confrontation skills and conflict management actions is People Styles at Work: Making Bad Relationships Good and Good Relationships Better , by Robert Bolton, and there are many excellent consulting firms that address workplace toxicity through team focused communication skills training and open discussion of problems (e.g. Ridge Training, the Forum Corporation, and others). Finally, effective company management often handles workplace morale problems by assigning external or internal Organizational Development experts to implement serious interventions such as structured confrontation meetings, mediations, employee surveys to tap and understand attitude and morale, and other team-building strategies. Understanding The Truth About Top Management is Critical. You describe management as being so incompetent or old-school, that I’m reminded of the days of the Industrial Revolution, before participative management, quality circles, or even suggestion boxes. It’s always amazing to hear of such anachronistic work cultures still existing where employees live in fear, darkness, and autocratic atmospheres to the detriment of productivity and morale, but it sure sounds like that’s the case. So top management may be too unskilled, complacent, or unevolved to see the need for change. Your seemingly traditional management probably needs a wake-up call or some new and healthier blood before they are likely to bring in a coach, install company-wide communication improvement programs, or launch wide-scale interventions to address such problems. Sad but true. Sounds like this downward spiral has gone on a long time. The complaining and “squeaky wheel gets the grease,” which means that management is either in denial and turning the cheek because they are too unskilled or too weak to take action (Old World and Worst Practices), OR they are colluding with the bully as part of a highly political, cut-throat company political environment. If that’s the case, you must consider what possible hidden agendas and private alliances might be going on. Is the Crab being allowed to continue un-monitored for a darker reason? We’ve seen everything from bribes, threats, blackmail, affairs, unethical or illegal behavior being hidden, and worse. We’re also not clear how large your company is, but if it’s a smaller, family oriented scenario, you’re into a whole Pandora’s Box of possible dysfunctional dynamics that can fester for years because the organization is so insular. Am I cheering you up?? So depending on your answers to what’s really going on (is it mere management stagnancy and incompetence or more conniving fueling of this overly political behavior and culture? ), make decisions about possible next steps. If the super political scenario is percolating, you are on thinner ice and may make lots of enemies, so only act in numbers and after very careful weighing of the risks. Network to see if anyone in human resources can be trusted to sort through the options. You’ve been around long enough to hopefully have enough direct knowledge or input through a trusted network to diagnose the situation. Is It Safe to Play Hardball with the Crab? If it’s not a Shark Tank scenario, but merely old school, incompetent management, it might be safe to gather data with others to approach HR and management with a request as described above to either censure, train, coach, move, or terminate the Crab. Consider petitioning management openly or anonymously about the need to protect yourselves and the company from this dangerous person. After all, from the looks of things, it’s really tough to imagine Crabby ever getting any real work done herself during his full-time espionage, so you may be able to make a strong case for how little she contributes and where the company would be without the people she targets. Couch anything that could be interpreted as a threat under the umbrella of wanting to protect the company. Remember, you must first be sure you all are solid, strong workers with a stellar reputation as delivering product and results, and not just whining complainers. You must also document every foul deed verbatim by the Crab, and all be willing to suffer the consequences if it turns out she does have management in her hip pocket. I once discussed with a person his planned launching of a crusade by writing a letter under the auspices of rescuing the organization from a similar misguided cross between Napolean, a KGB spy, and the Emperor’s New Clothes’ impotent but self-important ruler. He was writing that he was concerned about company welfare since in his graduate studies he’d read many times that helpless workers revert to unions, work slowdowns, or sabotage. He would describe the days of the Industrial Revolution, when the French word for “sabotage” gained special meaning from its literal translation, “to throw in one’s shoe,” which is what factory workers did to the factory machines to cause a massive breakdown. The abused letter-writer also wanted to reference modern times, when to deal with an injustice in the face of helplessness, workers have often banned together to take action. A few years back, the top 60 financial advisors in the Fixed Income Division of Credit Suisse staged a mutiny against a command and control top manager by defecting to rival Barclays, taking the firm’s key accounts and clients with them. It cost John Mack, at that time CEO of Credit Suisse, millions in inflated pay packages to woo back those who jumped ship. 1) You say the only reason she became manager was that she complained. Perhaps decision-makes just said, “OK” to get her to shut up. I have not heard any evidence that she is truly a powerful wheeler-dealer, or in the inner circle, is she? 2) You have not cited anything bad as happening to the Crab’s targets, even those you say had their reputations trashed by her. They are still around, haven’t been demoted, haven’t gotten pay cuts, or been censured/disciplined by anyone other than the Crab, right? Could I be correct that perhaps top management takes her groaning and badmouthing with a grain of salt and you all can relax more? If you ARE swimming in a shark tank, meaning it’s not only the Crab, but most of top management who are allowing or even encouraging such destructive behavior, then OUCH –– she has more power and manipulative skills than the possible “Hardball” strategy assumes. Be far more careful and consider finding ways of living with the situation until you can leave. Don’t kick yourself. It’s not as if you’re naively doing “water ballet” in the shark tank, because you see the situation for what it is and are not in denial. But you may need to “tread water” and play the game with the Crab, and fly low under the radar. Make as many connections with other powerful managers as you can and become invaluable. 2) Write her or request a meeting, and thank her for the feedback, even eliciting advice on what you can do to address your performance gaps. If enough people do this, who knows? Maybe she’ll have her hands too full to have time to target her next prey! 3) Again, keeping it within the team, gather every single victim and similarly request a group meeting to all express how sorry you are about her disappointment in your contribution and BS her over-blown ego with how much you need her guidance about what to do. We’ve actually known of power tyrants so full of their own hubris that they become intoxicated by the flattery and calm down in appreciation of someone finally valuing their wisdom! 4) Gather all of her written letters and emails, bind them, and approach her saying you know a publisher of business books who might be interested in these case studies of incompetence and you’d like her to coauthor a book with you. (We actually have a client/friend, T.T. Douglas, who has chronicled a small volume of the many clods for whom he’s worked and published these under the title of One Hundred and Twenty Five Corporate Management Types, Plus Two) as a form of coping and catharsis. Omigosh… the response is amazing and the illustration is genius! This is fantastic and insightful advice and I am sure it will be of great benefit to us and to many others. This offers a million different insights and coping strategies. A thousand thanks to the author, Rick Brandon. And to you, Franke, for providing this venue. It is a truly great response. I want to run out and take courses from the author! Years ago I adopted the attitude of, “When I retire I’m going to write a book. You may be a chapter in my book OR you may make a direct deposit to my savings account. Either way, I win.” Now I’m wishing I’d saved even more of the stupid memos, emails and various communications I’ve witnessed through the years. Great advice. I like this advice a lot. In our department we have promoted so many crabs and they also lack supervisor skills. I am praying that our office will change. It seems to me that you have a good chance of getting this “crab” removed since you have strength in numbers. Talk to the higher ups as a group and see if anything can be done to halt the “crabs”escalation of power. If everyone in the office is feeling the same way then you must have a valid argument against this person. I just wanted to know how you would define someone, who informs the boss when he or she has been threatened unprofessionally by a colleague or has been receiving unprofessional comments about the lunch they eat (the very bread and butter we work so hard for). Are they “crabs” too? Don’t they have the right to survive too? I don’t think just removing your “crabs” are going to do you any good. Circumstances and people like yourselves are what turns them into your so-called “crabs”. Besides, what harm did the real sea-creatures (crabs) do to harm you? Think about it. Besides, when you carry out any of the above suggestions, you are no different from the “crab”, who is trying to let her problems at work be known. How do you know whether the “crab” is a good worker or not? A company recruited me, because their dead-end content was getting nowhere. I am a hard-working content writer (and have made a few wonderful marketing suggestions to my employer and without hurting the interests of any of my employees), but was threatened by a data entry operator in my company when I was writing content for the social media, which drew a huge response, that he would tell my boss that I am “posting jokes”. I replied him saying that I was only doing the work I was assigned and he still continued his unprofessional behavior by threatening me. I informed my boss personally (one to one) about this because it was interfering with my work, but I did face some other problems and I never reported any of the others to my boss. So, would you still call me a “crab”?